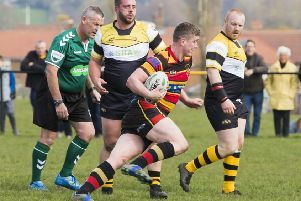 Wyke returned to action looking to cement a top-four finish in Division 4 of the Yorkshire Junior League, knowing that two wins would guarantee them third place. Wyke’s fast start was rewarded two minutes in when stand-off Cameron Scott found a gap to race through and score. The lead was increased on five minutes as Scott released scrum-half Connor Fawcett out wide who evaded a couple of challenges to run through and touchdown. Ben Proctor added the extra’s for 10-0. On 20 minutes, Cain Holdsworth went close then, from the next move, the ball fell to captain Sebastian Blanco, who squeezed in to score, Proctor kicking the additional goal for 16-0. The next score came from Scott with Proctor again on hand with the boot to make it 22-0. Second rower Liam Naven was next over with Proctormaking it 28-0 before Moor got on the scoresheet just before half time. After the restart, it took Wyke just three minutes to increase their lead, centre Jamie Robinson who taking a from close to the line to go over. Proctor made it 34-6. Naven and Scott then added further tries. The ever-impressive Scott then used his pace and power again to go over for his 40th try in 17 games and wrap up the scoring. n Wyke Under-8s returned from their summer break to take on a strong Chapeltown. Wyke started the game on the defence and unfortunately let a try in on the first set. Wyke forced Chapeltown back into their own half which brought their first score, as Lucas Range-Bennett ran through for his first try. This was quickly followed by tries by every single Wyke player, with a special mention to Bailey Tailford, Joshua Keegan and Toby Briggs who all managed to get on the scoresheet for this first time this year. Although Chapeltown did manage to get over the line in the second half, the home side proved a little too strong.